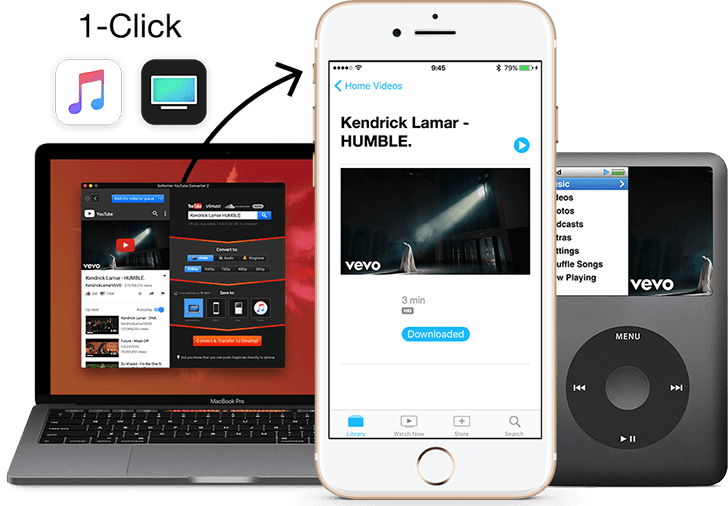 The Videos app on iOS devices is exclusively meant for Home Videos, Movies or TV Shows, either bought from the iTunes Store, or transferred to your device via iTunes sync. But often, you come across certain videos on social platforms or streaming websites, that you might want to save to your device for offline playback. One way to do it, is to use third party download managers and video players for this purpose. But sometimes, you might just prefer the native experience over everything else. Well, now you can enjoy downloaded videos and music, directly on your iPhone, iPad & iPod, within the native apps. SYC 2 from Softorino makes this almost-a-miracle feat, possible. SYC 2 is a Mac and Windows companion app for iOS devices & iPod, which can download & convert embedded videos from multiple websites, and make them available directly in the native Videos and Music apps. It’s compatible with every Apple device, including legacy versions of iPod, and is even capable of grabbing videos in 4K UHD resolution (maximum), from supported sites. Not only that, you can even pick a particular embedded video or audio from a supported website, and set it as your iPhone ringtone. SYC automatically makes it available in the Ringtone section of your iPhone Settings (Settings >> Sounds >> Ringtone). Of course, SYC 2 needs you to plug in your Apple Device to your computer, right? Wrong! It wirelessly connects with your iPhone, iPad or iPod, as long as your computer and Apple device are sharing the same WiFi Network. And with fast Automatic WiFi technology, the transfers are fast and zippy. SYC 2 is built by the same company which gave us WALTR, and is based upon similar principles. Only, instead of drag and drop, the app lets you browse and pick videos to download, and they are converted and transferred on the fly, into Apple’s native apps on iPhone, iPad & iPhone. The user interface is simple, intuitive and self-explanatory. It even includes an in-app web browser, so that you can search and pick videos to download from supported websites, directly from within the app. Download & launch SYC 2 on Mac or Windows. Connect your Apple device to the same WiFi network as your computer. Search for an online video or copy the URL in the search bar. The video will now open in the built-in browser on the left side. Click on the “Add this video to queue” button. In the Convert to section in the right side, select the appropriate options for Video, Audio or Ringtone as preferred. In the Save To section, select the device you want to save the converted video to (Computer, iOS Device, iPod, or Local iTunes Library). Finally, click on the Convert & Transfer button at the bottom. The video will be sent to your selected location in the selected format. Automatic WiFi: SYC 2 wirelessly recognizes and connects to all Apple devices connected to the same WiFi network. You just have to select the preferred device and start downloading. Universal Connection Bridge: SYC 2 connects to all iOS devices and iPod, allowing you to download and transfer audio, video content on-the-go. The files are available on your device almost as soon as the download is completed! Automatic Content Recognition: SYC 2 automatically detects content as you download them, and adds proper metadata, so that they are well organized within the native Videos and Music apps. Improved Speed: With lots of new technologies under the hood, SYC 2 is now 4X times faster than its previous generation. Trim-less Ringtones: SYC 2 automatically converts online videos into iPhone ringtones, readily available on your device. In-app Browser: You can directly search online videos and download them using the integrated web browser in SYC 2. 4K Ultra HD Support: Wherever available, SYC 2 can download videos in 4K UHD, allowing you to take the full advantage of Retina displays. Automated Forced Subtitles: Wherever available, SYC 2 can grab subtitles from any video. For this, Subtitle Support needs to be enabled in SYC preferences. Full Playlist Support: SYC 2 can download entire playlists to your Apple devices. However, this only works with less than 100 videos per playlist, as of now. Supported Websites: SYC 2 supports downloading content from more than 50 social media and video sharing platforms. SYC 2 is available for Mac and Windows PCs, on the official Softorino website. The free trial lasts 24 hours, following which, users can purchase a lifetime license for $19.95. But for 7labs readers, there’s an exclusive discount of 10% (up to 59%) on all SYC 2 licenses.